Makoto is the sister restaurant of Masuya (also in Sydney). I had the chance to check it out when I was in Sydney for a few days for work, and managed to squeeze in a dinner with my cousin who works in Sydney and recommended the place. Words cannot express how happy I am that I had the chance to sample some of its delectable offerings! The seared salmon sushi (in the first photo) is definitely my favourite. I could probably eat 5 plates of it and be very content :) It had this amazing smokiness to it, and when coupled with the awesome sweet soy sauce that had been sprinkled over it, produced this highly satisfactory burst of flavour. Oh man so good. Had 10 plates of sushi between the 2 of us, and the bill came to $40. I'd happily pay that same amount again for that quality of food. I highly recommend this place if you like Japanese food, and happen to be in Sydney. Seared scallops - almost as good as the salmon version! But anyway, a few weeks (*ahem* months) back, I FINALLY had a reason to check out Miss Chu's. Being a mere stone's throw from where I live, it's quite surprising that I never ventured into this little so-called tuck shop that has been much talked-about in the Melbourne food circles. The shop itself is very quirky in a classic, olden-day, Vietnamese fashion with large monochrome pictures plastered over the walls, little wooden stools and tables filling the space, and dome shaped light hoods swinging lazily from the ceiling. The outdoor eating area at the front of the restaurant is also a very nice place to sit and enjoy a meal, weather permitting. The ordering system is fairly unique to this part of the world - you indicate the number of serves of each item you would like on a little "order-form" and pass it to the waiter when you're done. It's fairly non-intrusive which might appeal to some people. I personally don't mind either way, as long as my orders are noted correctly! Started off with the rice paper rolls that this place is apparently famous for. We had the roast duck and banana flower rice paper rolls ($8 for two rolls). It was served in a little cardboard take-away container with dipping sauce in a little plastic bottle on the side. Interesting... Would've preferred having it served the usual way, i.e. on a plate, but this wasn't too bad. The rice paper rolls themselves were tasty, but could've had more duck in them - it seemed like it was packed with lots of vermicelli, some vegetables and herbs, and a sprinkling of duck. I may be exaggerating slightly here, but I was quite disappointed at having been charged $8 for 2 rolls that had barely any duck in them. Tsk tsk tsk. To drink I ordered the genmaicha (green tea with roasted brown rice), and my dinner companion ordered an interesting shaved ice drink with coconut, banana and mint... LOVED my genmaicha, but thought the other drink was a bit of a weird combo. Next we had the Traditional Pork Hanoi deep fried spring rolls. These were soooo yummy! I actually ended up eating them with with the dipping sauce we were served for the earlier rice paper rolls, rather than its intended dipping sauce, coz I liked the first sauce more. Bite-sized rolls that seemed to be singing in their wonderful, golden, deep-fried glory. After we had the Prawn and Crab Net spring roll warm vermicelli salad. This was definitely the highlight of the meal (once we'd added some extra diced chilli in). Sweet dressing, crunchy and fluffy spring rolls, soft vermicelli, fresh salad leaves, diced chilli, and fried garlic - the combination speaks for itself. All in all a pleasant dining experience. The food could've done with a bit more punch though - it lacked the massive explosion of flavour found in other Asian eateries. But that's my personal preference. On a later visit, I tried the young coconut juice - it was a truly authentic South-East Asian experience, albeit served in a plastic cup instead of the traditional coconut. Definitely worth a try! Gave Mamasita a second chance a few weeks ago and was pleasantly surprised :) I'm not sure whether it was the fact that we were there for lunch and the atmosphere was significantly less hectic, or just that the kitchen had realised that standards were slipping and decided to pull up their socks but what an improvement compared to the last time I was there more than 1 year ago! 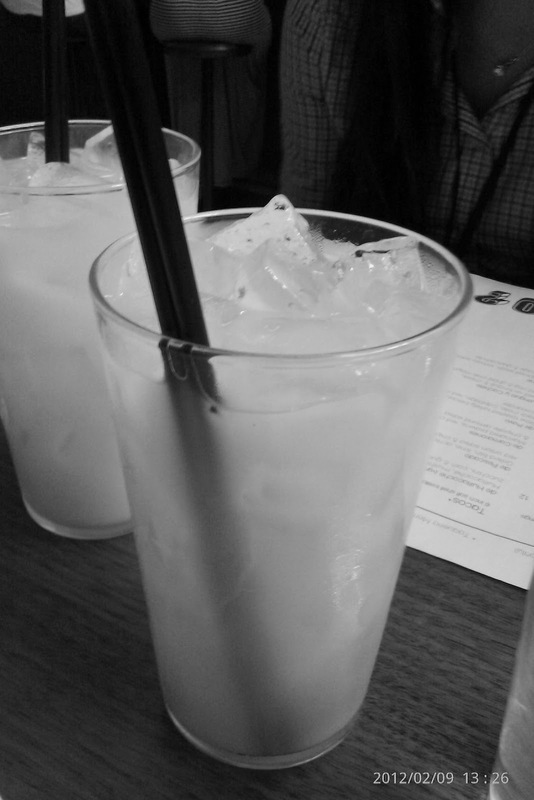 Given that it was lunch on a work day, and I wasn't in the mood for anything with alcohol in it, we were recommended to try the "horchata" by the waiter who explained it to be a cloudy white-coloured, sweet drink made from rice... Ok... It sounded interesting enough and promising enough for me to give it a go. I wasn't disappointed :) It was very tasty and quite unique to any other drink I've ever had. My lunch buddies and I were very happy with our decision to try this drink. 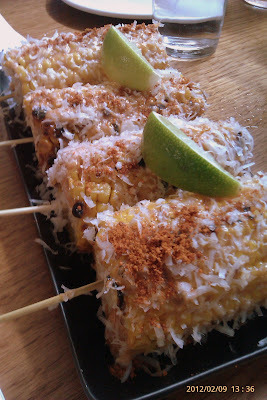 Definitely worth sampling if you're ever dining at Mamasita. 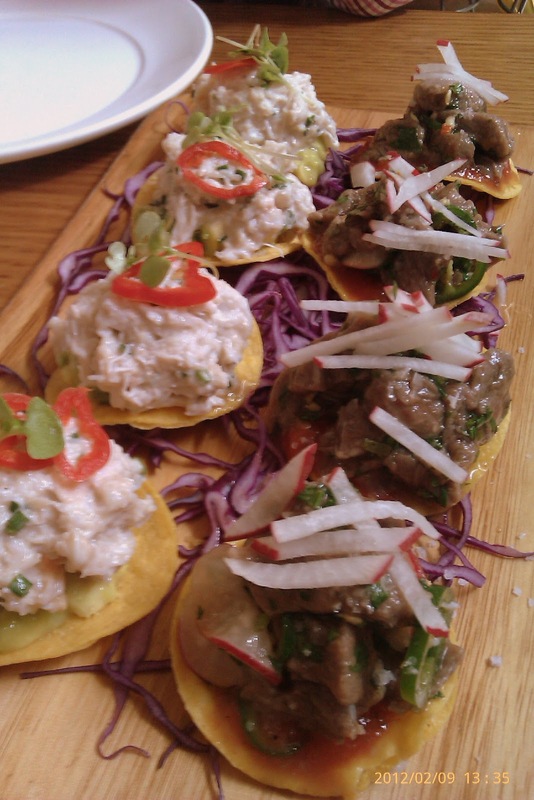 Next, we ordered 2 sets of tostaditas - crab meat, avocado, cucumber, tamarind, mayo & habanero, and orange-cured venison, chilli, radish. The crab meat tostaditas were a winning combination. The venison tostaditas were tasty, but I found the texture of cured venison to be quite different to anything I was used to. But I still liked both tostaditas. 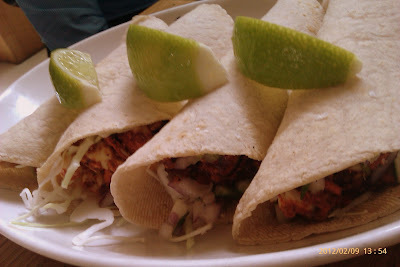 Then we ordered the grilled fish tacos - very tasty! The seasoning was just my cup of tea, and the chunky onion, parsley, chilli and olive oil mixture that was served with it was the perfect accompaniment. Next we had the chicken quesadillas - very tasty, but not a standout like the previous 3 dishes. Still it was very enjoyable. Next we had the snapper ceviche. Ceviche is made from fresh raw fish marinated in an acidic medium (usually lime juice) where the acidity of the juice cooks the fish. It is served chilled, usually with other condiments like onion, chilli and herbs. It is very refreshing and the texture of the fish is just right. 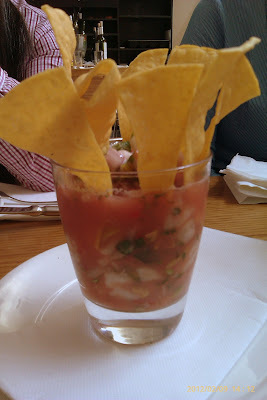 The ceviche at Mamasita was very tasty - tangy, spicy and fresh. I really enjoyed it. 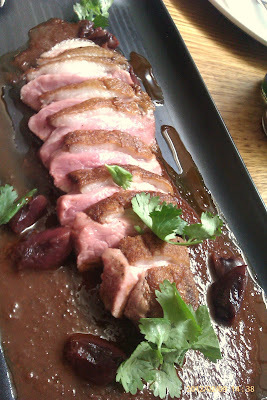 Finally, we had the roast duck breast with adobo sauce, pickled cherries and coriander. While the duck was cooked perfectly, it lacked proper seasoning - my lunch buddies and I found this dish to be quite bland. Kinda sad because it had the potential to be so amazing. 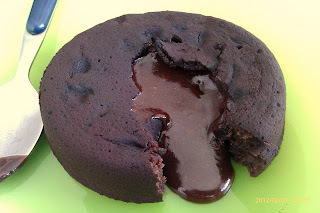 SK had allowed us to sample the result of his attempt at producing the silky, rich chocolate cake with the delightfully gooey, molten chocolate centre that is the subject of this particular post. Cue DROOL. Naturally, I was craving it again a few days later. Got the recipe from SK and voila, a little (long) while later, I had baked my very own chocolate moelleux! 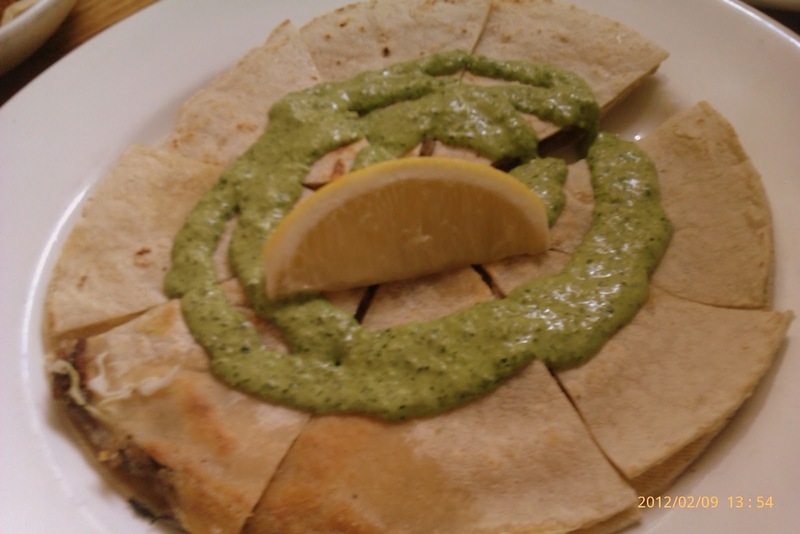 The recipe is amazingly simple and also just plain amazing. The only thing that takes time is having to butter and dust the ramekins with cocoa powder so that the moelleux can easily turn out of the mould onto a plate for serving. If you're lazy, no harm skipping the cocoa-dusting step if you're happy to eat straight out of the ramekin (or mug - I used mugs because there weren't enough ramekins in my apartment). Whisk together the sugar, egg and yolks till smooth. Melt the butter and chocolate over a double boiler, or in a saucepan over very low heat so as to not burn the chocolate or butter. Add it to the egg mixture slowly. Lightly fold in the flour (sifted). Put roughly 100ml of the mixture into each ramekin (should be enough for 4 serves), cover with clingwrap, and refrigerate for at least 2 hours. Pre-heat the over to 190 degrees Celcius (fan-forced) and bake the ramekins on the tray for 13 minutes. Depending on the oven, the actual baking time may be 1-2 minutes longer or shorter, so just watch your moelleux the first time you bake it. It's ready when the top is cooked and slightly firm to your touch, but a bit "jiggly".